The Accidental Prime Minister: Equipped with sharp suits and a smirk, Akshaye Khanna portrays the former media adviser, Sanjaya Baru, with great ease. 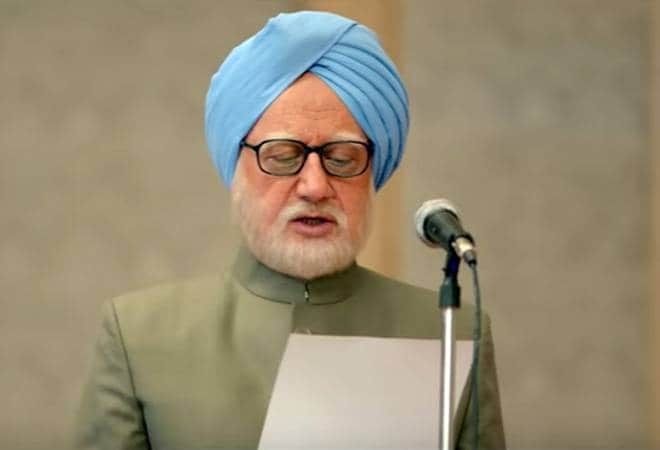 At one point in Anupam Kher's The Accidental Prime Minister, Sanjaya Baru played by Akshaye Khanna, tells the audience about former PM Manmohan Singh - "Bade kamzor insaan hain". That dialogue summarizes the entire tone of the movie. At parts it appears as if the makers want to project Dr Singh as an honest, idealistic person, who became a scapegoat of the Gandhi family and in other times it appears as if the makers want to put across that the former prime minister was an ineffective leader. The only constant in The Accidental Prime Minister is the utter, complete disdain for the Gandhi family. To begin with, the film picks on Dr Singh's simplicity and projects him as a simpleton. Everyone else, in and outside the PMO is more clued in about how politics works. The film suggests that taking advantage of Dr Singh's nature the Gandhi family put him as the front of the party and made him take responsibility of the spate of scams that haunted Congress. To pad up this argument, the makers even put in a scene in the beginning where Dr Singh admonishes Sanjaya Baru and says that he should take responsibility of the fault of his subordinates. The Accidental Prime Minister totally takes away agency from the former prime minister - which is rather unfair to any neutral eyes. The Accidental Prime Minister also suffers when it comes to the screenplay. Shoddy is putting it lightly. The movie jumps from past and present incoherently. Director Vijay Ratnakar Gutte who also co-wrote the movie appears unsure of the treatment. It is a messy jumble - from dramatic scenes and real footage to asides and made-up news clips. However, the one thing going for The Accidental Prime Minister is the cast. It is quite fun to see so many onscreen avatars of real politicians. Some are quite a hit like former Finance Minister P Chidambaram and former President APJ Abdul Kalam, while some are big misses like Hansal Mehta's Navin Patnaik. However, Sonia Gandhi is played by Suzanne Bernert like an emotionless, reactionless individual, while Arjun Mathur's Rahul Gandhi is entitled and clueless. This brings us to Akshaye Khanna's Sanjaya Baru. Most unlike of any of the portrayals in the movie is Baru's. In one stroke the movie undermines Dr Singh while portraying Baru as the hero. There is only one hero in this political drama based on Baru's memoir - Baru himself. He even takes it upon himself to shield the innocent Dr Singh from The Family. Baru continuously breaks the fourth wall and speaks directly to the audience, very House of Cards-esque. Equipped with sharp suits and a smirk, Khanna portrays the former media adviser with great ease. Anupam Kher, on the other hand, comes across as a parody of the soft-spoken Dr Singh. One can't see beyond his hands that seem to be controlled like a puppet's. The effete walk and the subdued voice are attempts to recreate Dr Singh's personality but fall short and appear to be more of a caricature. The film painstakingly attempts to put across Dr Singh as 'kamzor', which is perhaps the biggest disservice to the leader. Also read: The Accidental Prime Minister Box Office Prediction: Can Anupam Kher's movie survive clash with 3 big releases?